Remember when I said that Thanksgiving is my favorite holiday? I wasn’t joking! Besides my fermented cranberries post that I gave you last time, I have a few other recipes up my sleeve that will be perfect for your holiday table. One of them is these roasted Brussels sprouts with bacon and maple pecans. 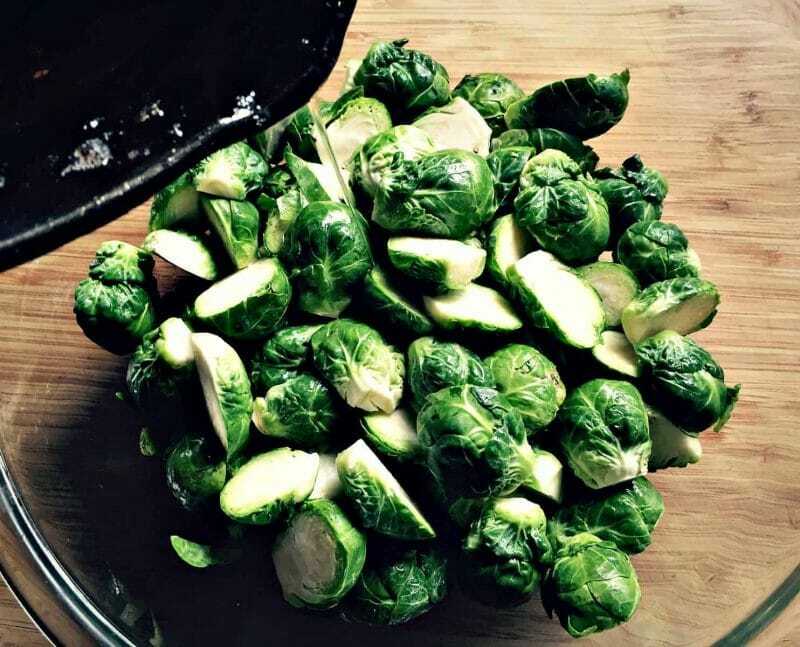 I know that not everyone is a huge fan of Brussels sprouts, but I really think that this recipe will win the haters over. I actually never had a Brussels sprout until I was in my mid twenties, I’m assuming because my parents didn’t like them. I had them in a soup and thought they were ok, but it wasn’t until I had them roasted that I started to sing their praises! Honestly, roasting any vegetable is the way to go in my book. It’s easy, fairly hands off, and the results are always awesome. Add a little bacon and some pecans and you have the makings of one darn good meal! 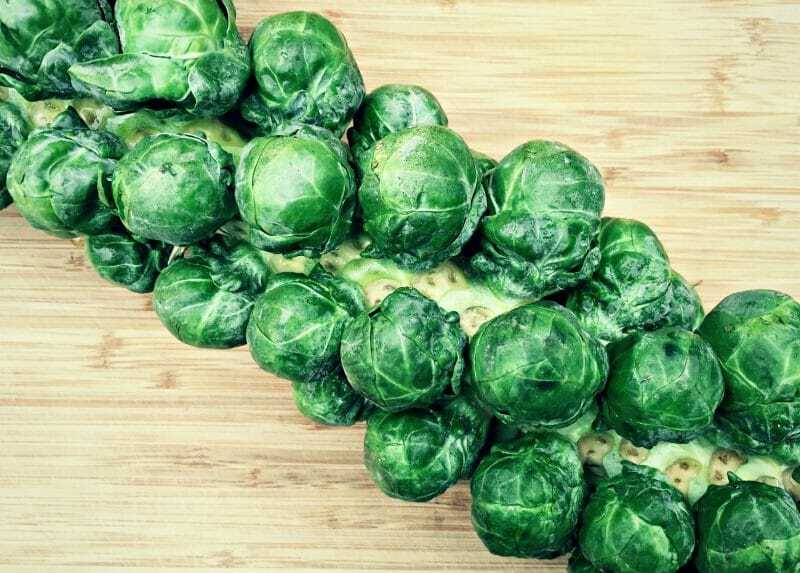 First, let’s talk about Brussels sprouts. 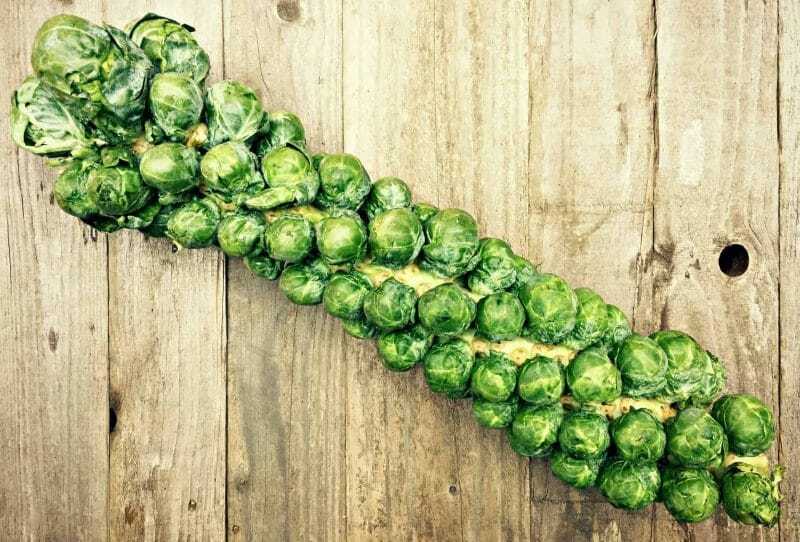 They are in the Brassica family which also includes cabbage, broccoli, cauliflower, collards, and kale. They grow on a big stalk, and are basically like mini cabbages, but tastier in my opinion. No, these were not grown in our garden (I wish!). Ours are still the size of marbles and may not be getting much bigger depending on what the weather does. I do love the spiral pattern they make! It’s usually only around this time of year that you will find them on the stalk like this. I would get them if you see them! Fall is when they are in season in most of the United States, and when they are on the stalk you know they are fresh. It does take a little bit of work to get them off, but nothing that a sharp knife won’t take care of quickly. I didn’t give amounts and I know that might make some of you frustrated, but to be honest amounts really don’t matter. You like bacon? Add more. You want your pecans less sweet? Use less maple syrup. I’m here to teach you how to cook, not how to follow a recipe. That said, I made one sheet pan full, which will feed about 6-8 people (maybe less if you have some real sprout lovers). So use that as a guideline if you’re planning on having a crowd! First you want to toast your pecans in a dry skillet on medium-low heat. I used about a cup of pecans, enough for a single layer in the pan. Stir them constantly until toasty and fragrant, then put into a small bowl and set aside. Be careful as nuts go from pleasantly toasted to straight up burnt very quickly (I’ve made that mistake more than once). Drizzle about 2 Tbsp maple syrup onto the warm pecans, add a pinch of salt, and stir to coat. 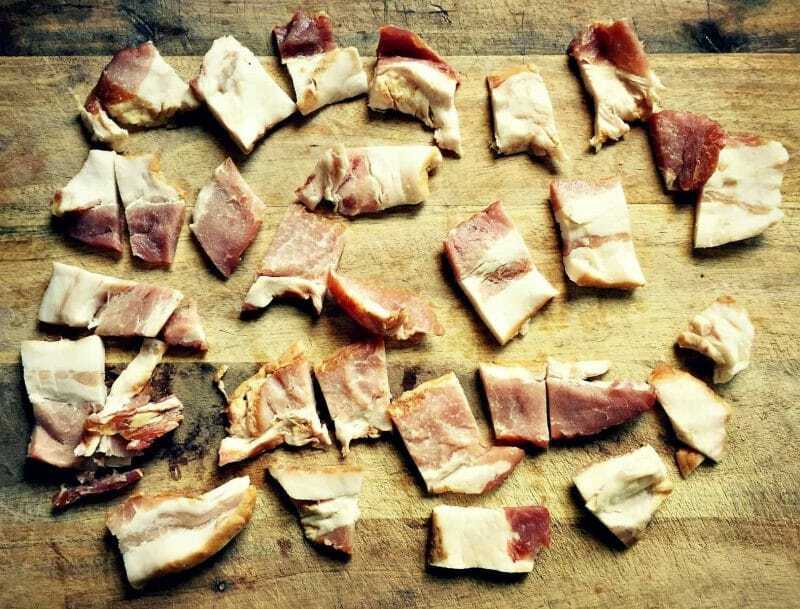 Meanwhile, chop up some thick cut bacon into chunks. Fry them up until your desired crispness level. Then take them out of the pan, add them to the pecans, and toss to coat. Preheat your over to 400°F. Then trim and cut your Brussels sprouts in half. Don’t get too crazy with the trimming, just pull off the outer leaves if they look holey or wrinkly, and trim the stem if it feels hard. Put the cut sprouts into a bowl and add the rendered bacon fat. Add a sprinkle of salt and stir to coat. If your bacon didn’t render much fat use olive oil instead. But use the fat if you have it because it makes everything delicious! Then put your sprouts cut side down in a single layer on a baking sheet. I know, it seems a little finicky of me to have you turn every little sprout cut side down, but trust. This is how it needs to be. Put them into the preheated oven for about 20-25 minutes, until they are fully cooked and golden brown. Put them into a large bowl along with the pecan/bacon mixture and stir to combine. Transfer to a pretty serving bowl (sorry, I don’t have any pretty ones), and that right there is the best vegetable side dish you could ever have! Add some dried cranberries if you’re so inclined, and maybe even some feta or blue cheese to make it extra fancy. I like it just the way it is, though, simple but with a little bit of flair. I even made a “chefs snack” super mini slider out of them. That’s one good part of being the cook, you always get the best bites! 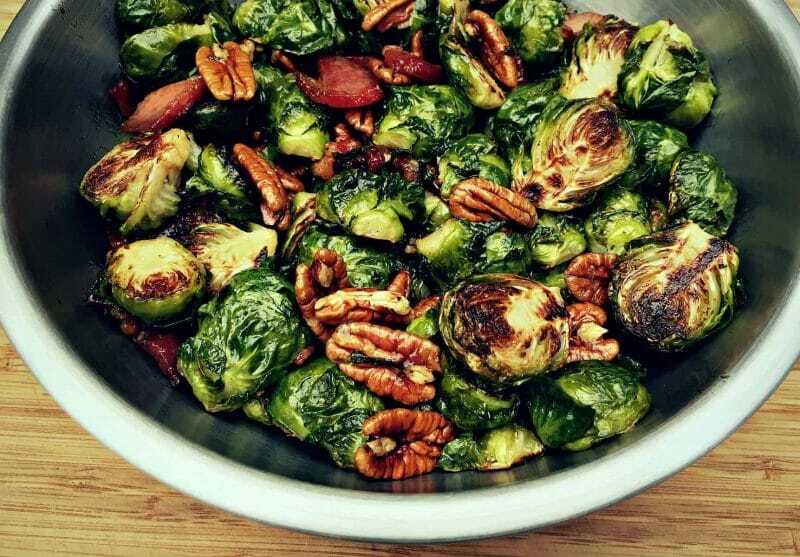 These roasted Brussels sprouts with bacon and maple pecans is the perfect vegetable side dish. It is simple with a touch of fanciness, plus it tastes like the bomb! I mean bacon and maple pecans, how can you go wrong? And Brussels sprouts are healthy, right?!? 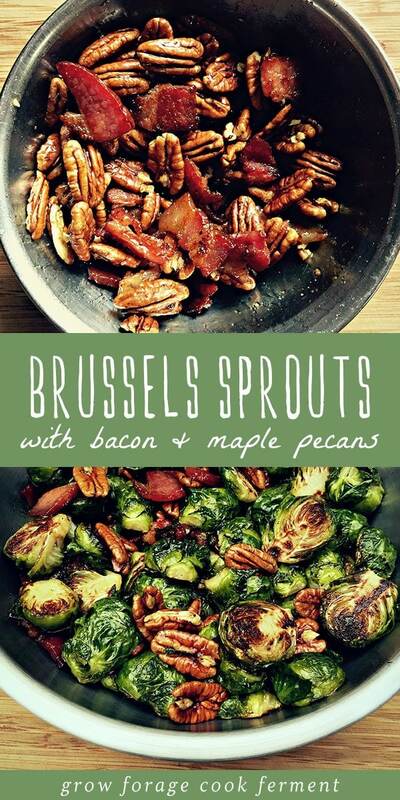 Maple bacon brussels sprouts are a family favorite! 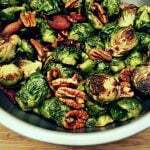 Tender oven roasted brussels sprouts are tossed with crispy bacon and maple pecans and make the perfect fall side dish recipe. 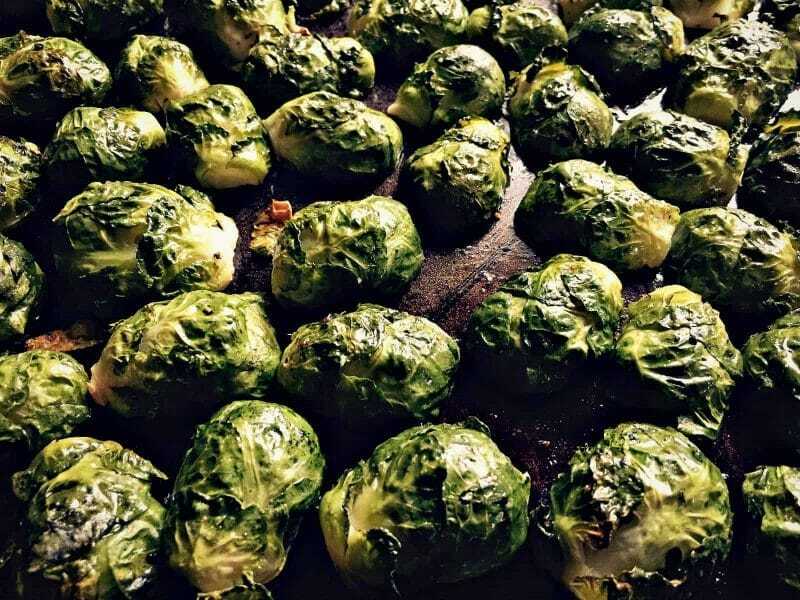 These sprouts are so flavorful, and perfect for Thanksgiving, Christmas dinner, or just a regular weeknight supper. 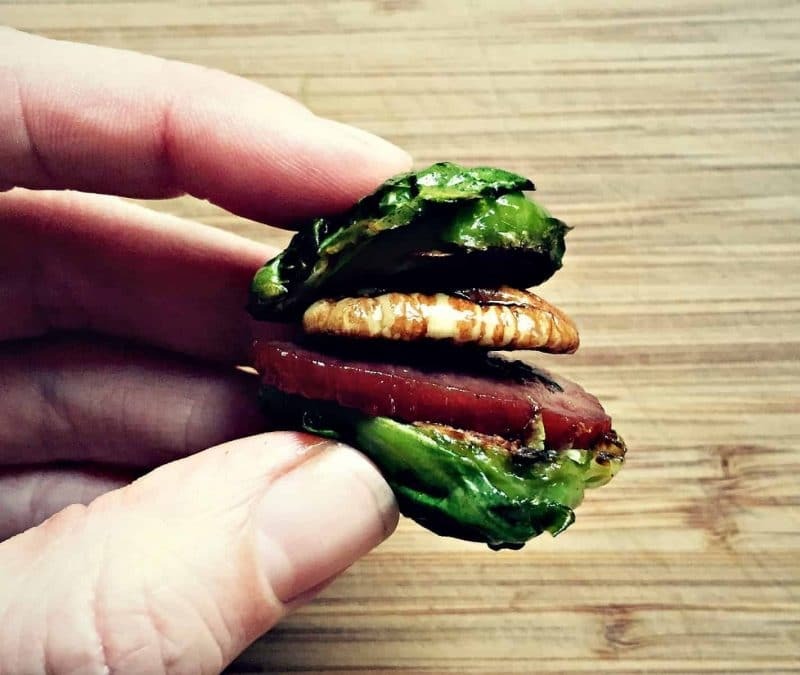 Even the pickiest eater will love them! 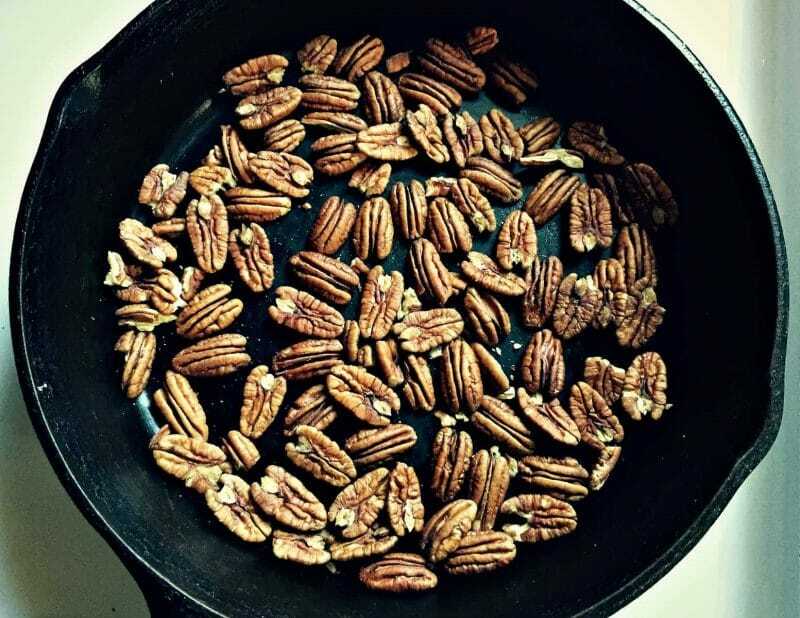 Toast the pecans in a dry skillet on medium-low heat. Stir them constantly until toasty and fragrant, then put into a small bowl and set aside. 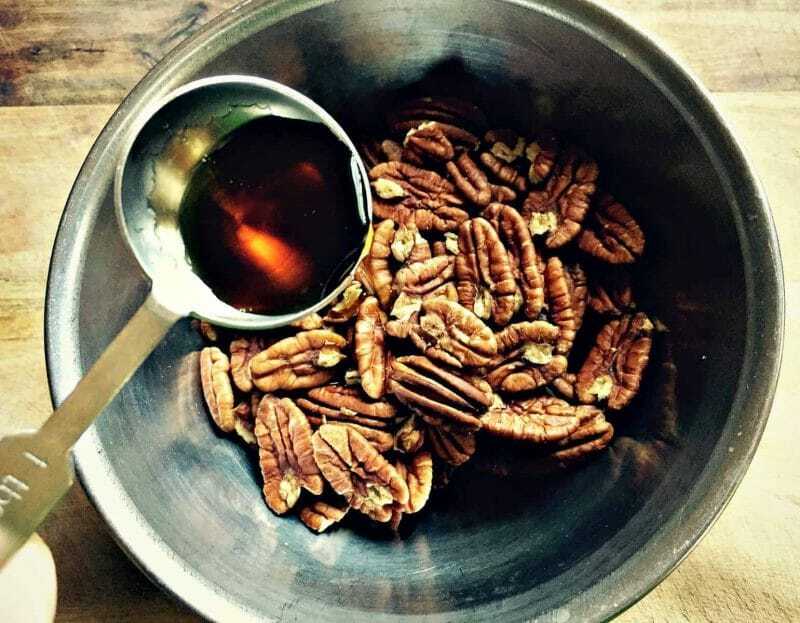 Drizzle about 2 Tbsp maple syrup onto the warm pecans, add a pinch of salt, and stir to coat. Meanwhile, chop up some thick cut bacon into chunks. Fry them up until your desired crispness level. Then take them out of the pan, add them to the pecans, and toss to coat. Preheat your over to 400°F. 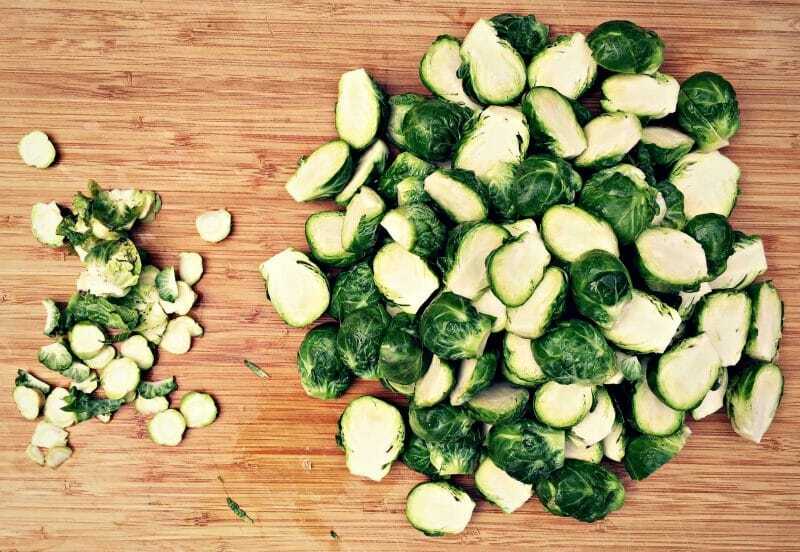 Then trim and cut your Brussels sprouts in half. Put the cut sprouts into a bowl and add the rendered bacon fat. Add a sprinkle of salt and stir to coat. If your bacon didn’t render much fat use olive oil instead. 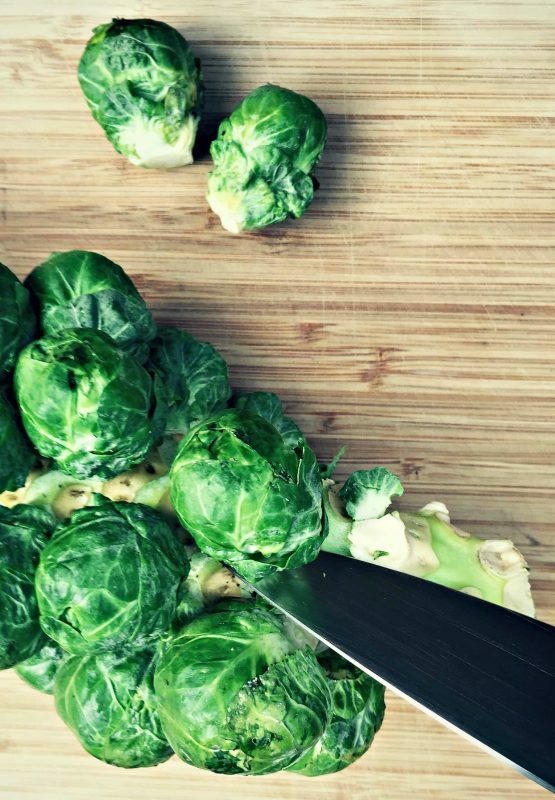 Put your sprouts cut side down in a single layer on a baking sheet. Put them into the preheated oven for about 20-25 minutes, until they are fully cooked and golden brown. Serving Suggestion: Serve with dried cranberries and/or some feta or blue cheese to make it extra fancy. Holy stinking moley this looks sooooooo good! Thank you for the yummy recipe. I roast Brussels sprouts with olive oil, salt & herbs de provence all the time. 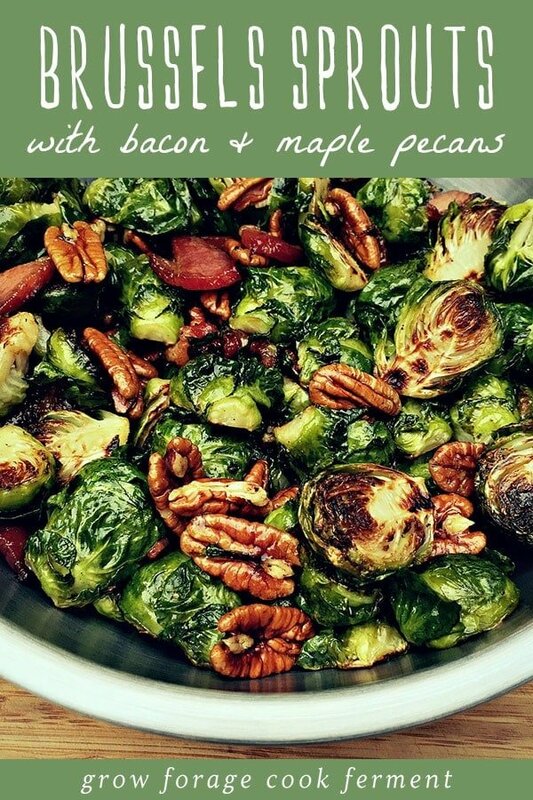 Definitely adding the bacon and pecans for the holidays. 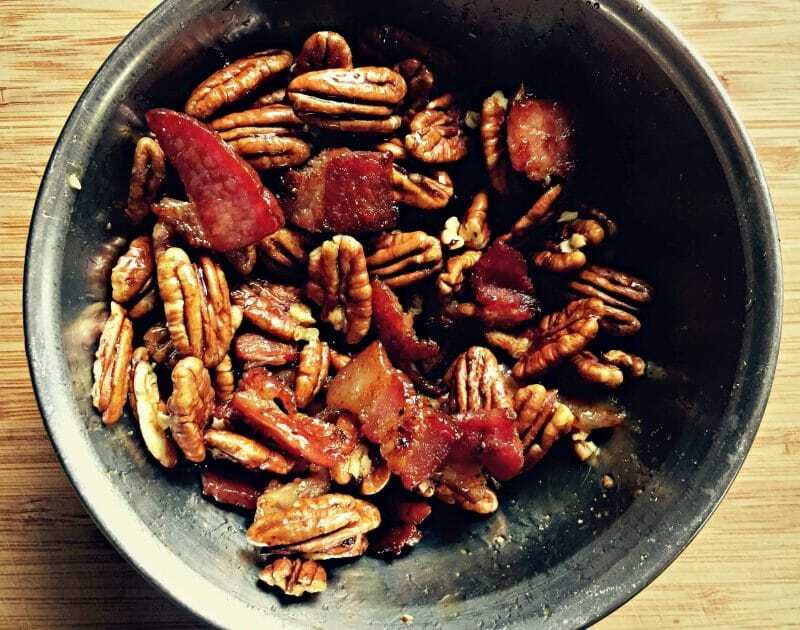 Have you tried peeling & slicing chiogga & gold beets, lay 6 strips of bacon over them in the oven @ 400; stir after 15 minutes and roast another 10 minutes, add pecans, roast for 5-10 more minutes. Can be eaten just like that or added to salad with avocado. A sure way to become a beet lover.